J. Lavallaye, s.v. Sutterman, in U. Thieme – F. Becker, Allgeimenes Lexikon der Bildenden Künstler, XXXII, Leipzig 1938, p. 324; D. Garstang, in Master Paintings 1400 – 1800, catalogue of the exhibition, London 1993, pp. 30 – 31; F. Moro in, L’Anima e il Volto, catalogue of the exhibition ed. by F. Caroli, Milan 1998, p. 199. Milan, Palazzo Reale, L’Anima e il Volto, October 1998 – March 1999, p. 199. The sitter has been unanimously identified as the painter Giovanni Lanfranco on the basis of the close resemblance between his features and the artists in Randon’s engraving for Bellori’s Vite (1672) after a lost self-portrait. (fig.1) In the Colnaghi exhibition catalogue Donald Garstang resolutely sustained the attribution of the painting to Justus Sustermas dating it to the first sojourn of the Flemish artist to Rome, where he arrived in 1627. The following year, on September 17th, Lanfranco was awarded by Pope Urban VIII with the cross of the Order of Christ and the absence of this important decoration may be read as a terminus ante quem. The attribution to Sustermans was endorsed also by Franco Moro in the Milan exhibition catalogue, but since then several scholars have questioned the attribution and have suggested that the work was painted in Rome rather than in Florence. More recently, Claudio Strinati has suggested to give the painting a more recent date circa 1640, and notes a close resemblance between the style the painting and the works that Michelangelo Cerquozzi and the painters of his entourage, the Bamboccianti, commencing during Strinati’s suggestion is endorsed also by Francesco Petrucci who notes a certain resemblance between our painting and the self portrait painted by Jan Miel around 1640 (fig. 2, England, private collection). 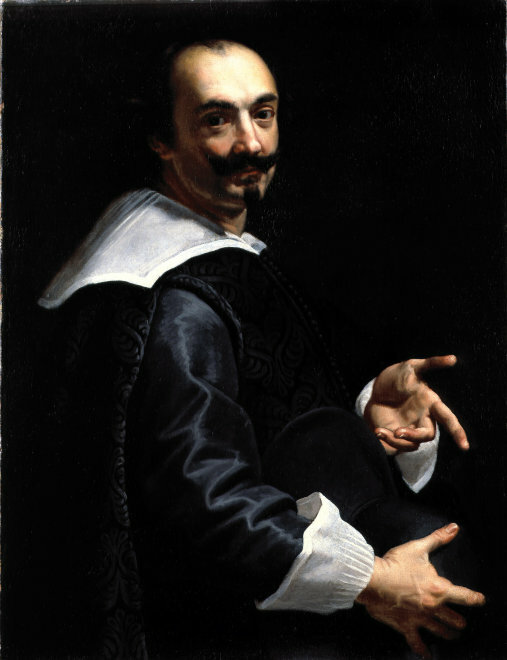 Even the style of the cloth that the sitter is wearing suggests a date circa 1650s and the expressive and vivid gesture of the hands fits more with the taste of Bamboccianti painters than with the official style typical of Sustermans portraits. Unfortunately painters like Michelangelo Cerquozzi and Jan Miel are better known for their genre paintings, the Bambocciate, than for portraits so it is still quite difficult to propose a definitive attribution for the present painting. The artwork described above is subject to changes in availability and price without prior notice. Where applicable ARR will be added.